How do I find and choose a care home? This can be a stressful process that you weren't prepared for, and even with lots of time to decide, it can still be hard to know what's right for your loved one. Their wishes and your instincts will clearly play a huge part in the decision, but it's good to be prepared, and know what to look out for and what to ask about when you visit care homes. Our step-by-step guide is available for download now and includes a handy checklist to take with you on a visit. We also explain some of the terminology used in the sector. Location – Where does the home need to be located? Near to you and other family Members? Close to specific clubs, facilities or services? Near to good transport links? If your family is spread out across the country, have a discussion about how often everyone plans to visit, to decide where might be best for your loved one to live. Types of care – What level of care does your loved one need? Residential or nursing care? Or a more specialised type of care? If you're not sure, find out from your family Member's GP or social worker. Not all care homes will cater for everyone and some will have more specialist nurses on staff for various needs. Make sure you check with the Home Manager before you visit. Philosophy – What is the care home's approach to care? How do they care for residents and how is this supported by what they offer in terms of programmes, recreational activities, food, etc.? You should be able to find out this information on their website. Find out more about brighterkind's care philosophy. 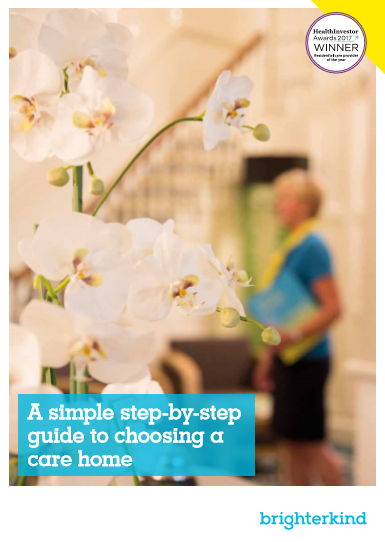 We hope this helps to make the process of choosing the right care home a little easier.